Composite actions like counter++ does not execute as a single operation. Instead, it is shorthand for a sequence of three discrete operations: fetch the current value, add one to it, and write the new value back to memory. 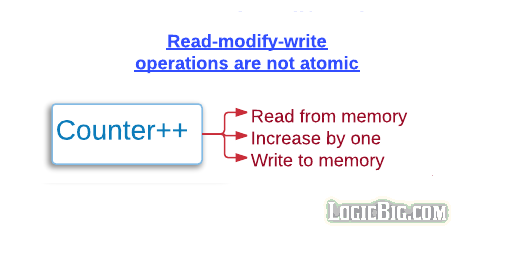 This is an example of a read-modify-write operation, in which the resulting state is derived from the previous state. In Java these kind of operations are not overall atomic by default. Assume two threads try to execute counter++ simultaneously without any kind of synchronization. As seen in the last tutorial to avoid visibility problem we have declared counter as volatile. Now assume the counter current value is 5, at some timing each of the two threads could read the value 5, add one to it, and each set the counter to 6. That means an increment got lost and the counter is now permanently off by one. In some scenarios this kind of behavior cannot be affordable per business logic. We are expecting counter value of 2000 at the end of the main loop. Two threads are used to take advantage of multiple cores and improve calculation time as compared to using just one thread. We are repeating the whole process 10 times to increase the chances of producing the problem we are investigating. Note that above output might vary for different kind of processor. In above output we are not getting output of 2000 every time, that's because the composite actions are not entirely atomic. At some timing the two threads read the same value of counter. We require our program to do gradual increment in counter variable by the two threads without overlapping reads and writes. All we need a total atomicity of counter++ composite operation. To fix the problem in our example, using AtomicInteger is the better choice because it implements a lock free mechanism to atomically increase the underlying int value.